Ah ok, thanks. That was tricky. Click a second time in triangle box for the key. Can't find candle? Or do you mean the thing that looks like a glass? Got a lot of coins. Use screwdriver also on little pic for a coin and to see the spade number. Lol, ok just found that by doing the math with hearts and spades. put coin from matches 2x in pink zodiac device for another coin to collect. Use the special coin 2x in the little pink machine to get another coin. Have 7 coins now in the machine behind the coffee pic. another coin from bottom of plant (again), after activating ceiling vent. Hi Premiere, idea for code birds? And thanks, did do the fan, but didn't go looking after that. Put coffee in coffee grinder to get another coin. Why won't the glass like thing go on the other glass with candle below it? That's how it looks like on the pic. Ok, you have to fill that glass with coffee from the grinder first and then it goes on. Then use matches on it and you get the clubs number. Ten coins behind pic gives a new key. And going back in to find the happy coin. Hm. I wonder if there's an extra happy coin. We already have 10 of them and when you use the key on the door it's not just open, but you go out. Can't find anything changed in the room after gettting the last key and no way to use the key without going out. So I guess this time it's 10 happy coins and coffee and cake. Ditto here (again! ), LOL - CU! So kind, seb! Many thanks!! Also -- I cannot set the cake & coffee on the table, even after removing the sundial rod. Any advice? thanks! And half my inventory is still empty... ?!!? Great fun - thanks Tesshi-e! If anyone happens to be around, where's the dang heart number? I've inserted the metal rod into the table but still don't see anything? Or just tell me the code for the middle cb.. please!! put stick in hole of little table with heart at window (=sun clock) & look at what number (roman numeral) the shadow is = heart number. Anyone still playing?? How to get picture to fall? Ah got it! Spell out COFFEE! Clever! There are letters behind the picture. So click the corners in the order of the word; COFFEE. Complete side note: I SERIOUSLY want a Mr. Birdy toy of my very own! Has anyone ever seen them for sale? I once left a message on Tesshi-e's blog but got a message back saying you can't post in English. If anyone could translate such a post to Japanese for me that'd be awesome (and such good karma)! robamimi - Pens and Note Paper. Once you put all coins in the machine, click it again and another coin drops. 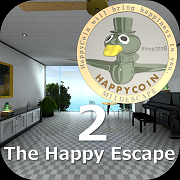 This is your happy coin. LOL. Well, that was quite an easy one. So thanks seb for the hint with the empty (!) bottle! It was the only hint I needed. - First, it is known that the number is 3-digit, so greater than 000 and less or equal than 1000. Thanks Tesshi-e, great game as always !! Thanks friends for the comments!! The bruteforcing is even easier than you described. If you look at the table with a 'heart' on it, then not only 48 (with result 017) is very unlikely, but most of the others too. There's a sun dial on the table so hearts can only be 1-12. So all you have to try is 8 or 7 for hearts. Oops, and of course 6 for hearts too (gives 952), but that's all, lower numbers give 4 digits. No, no, hold on. ;) Heh, I'm not that dumb. This was for the case that you OVERLOOKED the heart on the table and just thought it was some decoration or so. It was just a more general solution for cases when the item is well hidden and you for the life of yourself can't find it. I just pretended that the heart be hidden much better in the game (because Tesshi doesn't make it that easy for us normally). Thanks for the Replay, and Happy 10th Anniversary to Tesshi-e! Love your mildescape games!